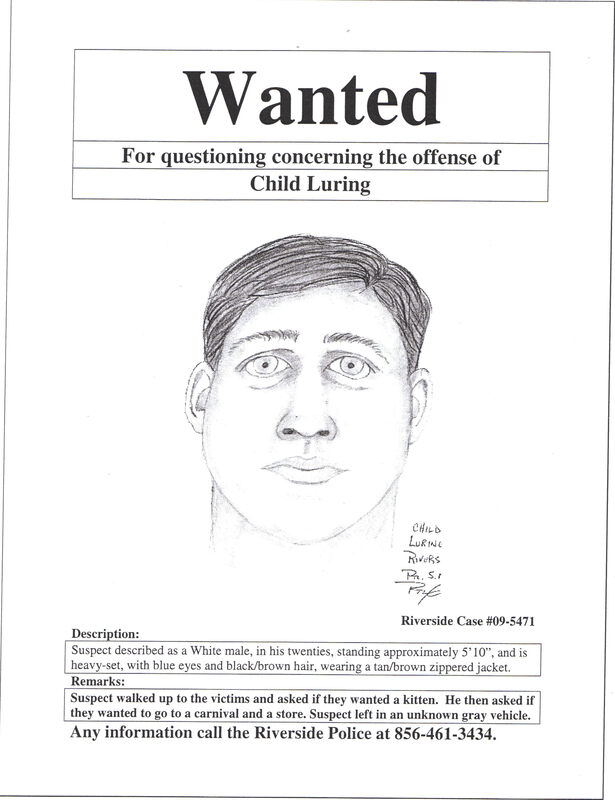 Riverside Police seeking suspect in attempted luring of two seven year old females on 10/16/09. 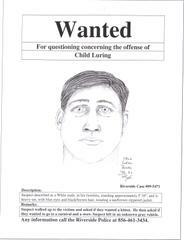 Riverside Police seeking suspect in attempted luring of two seven year old females on 10/16/09. The suspect approached the two females and asked if they "wanted a free kitten" or if they wanted "to go to a carnival and a store." The mother of one of the girls observed the suspect walking with the children and called them back to her. The suspect continued walking and left in an unknow gray vehicle, possibly a minivan. The suspect is described as a white male, 20's, heavy set, blue eyes, brown or black hair, wearing a tan or brown zippered jacket. Please contact the Riverside Township Police Department with any information about this incident at 856-461-3434 or 856-461-8820.